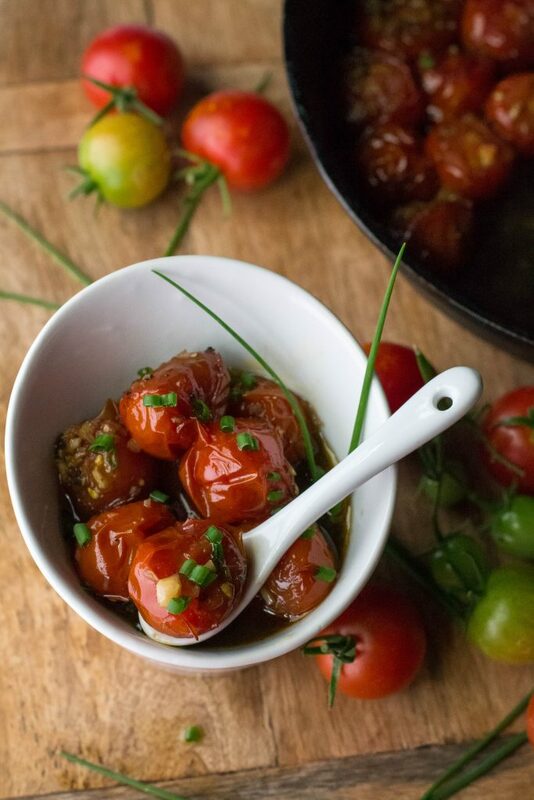 Balsamic Honey Glazed Cherry Tomatoes - What the Forks for Dinner? When your cherry tomatoes have taken over the garden…….mine actually buried my pepper plant…..you need to get creative. 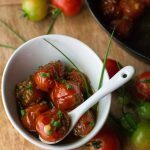 Balsamic Honey Glazed Cherry Tomatoes are my nod to creativity…..and the intense desire to not have my beautiful cherry tomatoes go to waste. For having such a small garden, we had a big harvest. Especially cucumbers and cherry tomatoes. My poor neighbors must have wondered where we got all the produce we keep pawning off on them. I just hate to see food go to waste, thank goodness for neighbors. With summer winding down I wanted to make the most of summer tomatoes. Nothing in the world beats their flavor, and nothing is more satisfying than growing them yourself. 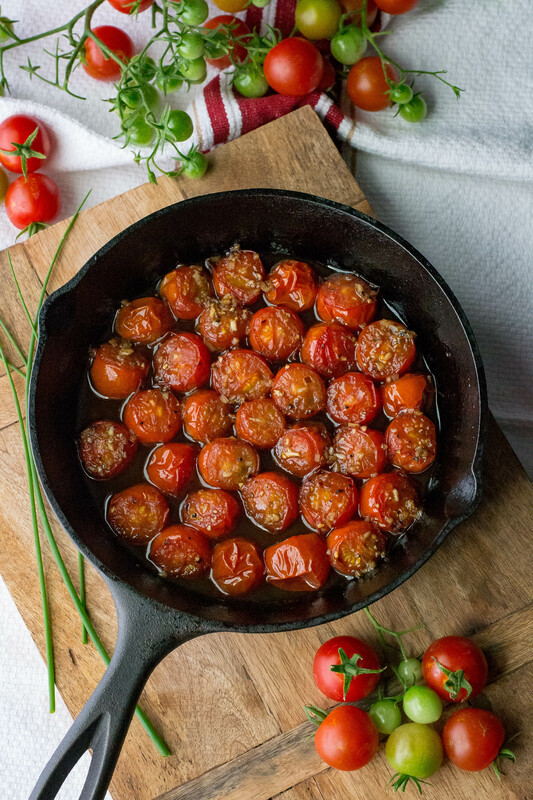 Place red ripe cherry tomatoes in a cast iron skillet, with just a sliver of the top cut off. Mix together garlic, honey, olive oil, balsamic glaze, a good amount of salt, and pepper, and roast for about 30-35 minutes. Then garnish with fresh snipped chives. Side dish, on top of pasta or rice, or bruschetta like on top of crusty bread with cheese. There is nothing these little beauties cannot enhance the flavor of. Roasting them brings out extra sweetness and a touch of honey is icing on the cake…well maybe cake is a bad analogy. 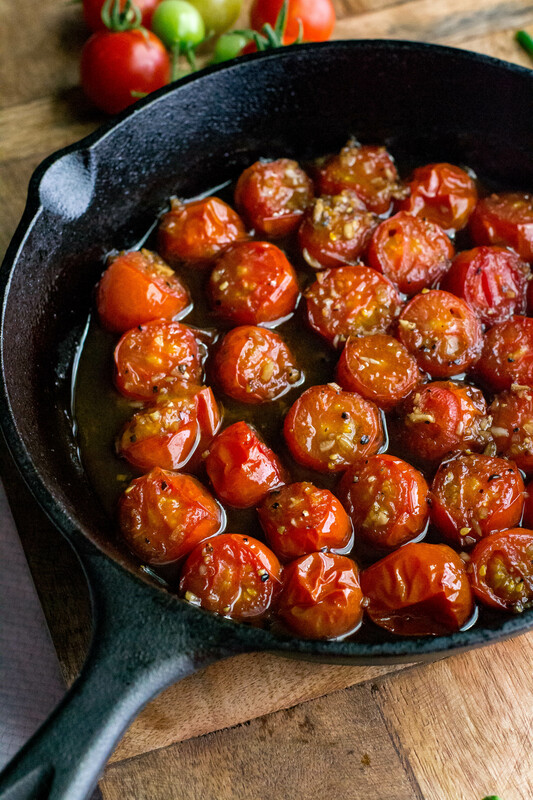 Balsamic and tomatoes are a classic combo, and this dish is no exception. If you do not have balsamic glaze, you can either purchase or make your own. Balsamic glaze is easy to make and can store in the frig for recipes, or if you just need a little something for a garnish. Speaking of garnish, fresh snipped chives make a perfect garnish for Balsamic Honey Glazed Cherry Tomatoes. 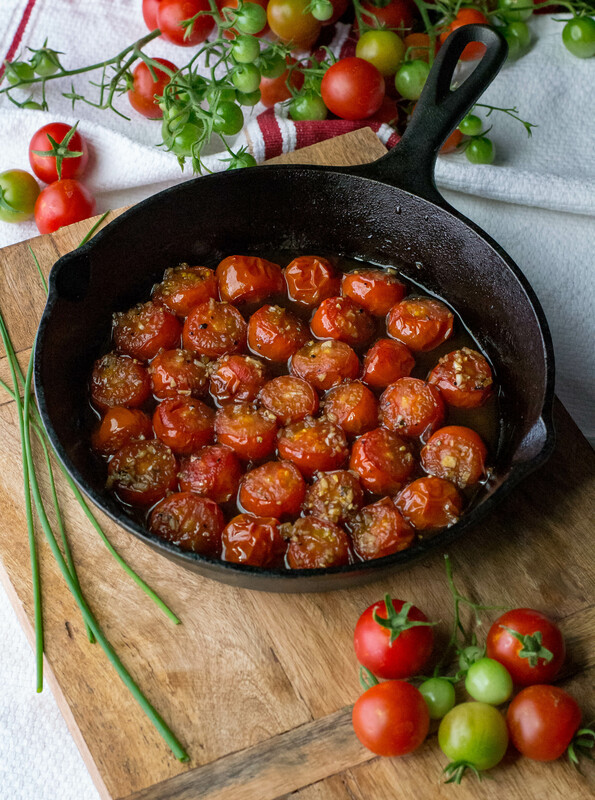 If you are over run with cherry tomatoes or maybe need to run to the Farmers Market to get them, you have to try Balsamic Honey Glazed Cherry Tomatoes !!!! I’m grilling up some bread to top now!!!! Spray a cast iron skillet lightly with non stick cooking spray. Cut a small slice off the top of the tomatoes and place them cut side up in the cast iron skillet. Whisk together the minced garlic, honey, olive oil, balsamic glaze and a large pinch of salt and pepper. Drizzle mixture over the cherry tomatoes. Roast for about 30- 45 minutes until juicy, and bubbling. If you have too much liquid after 45 minutes you can place the cast iron skillet on the stove top and reduce to desired consistency. Season to taste with additional salt and pepper. Garnish with fresh snipped chives if desired.